Much more than a busman's holiday! Translation affects every aspect of your life - and we're not just talking about the obvious things, like world politics and global business. Translation affects you personally, too. The books you read. The movies you watch. The food you eat. Your favorite sports team. The opinions you hold dear. The religion you practice. Even your looks and, yes, your love life. Right this very minute, translation is saving lives, perhaps even yours. Translation influences everything from holy books to hurricane warnings, poetry to Pap smears. It's needed by both the masses and the millionaires. Translation converts the words of dictators and diplomats, princes and pop stars, bus drivers and baseball players. 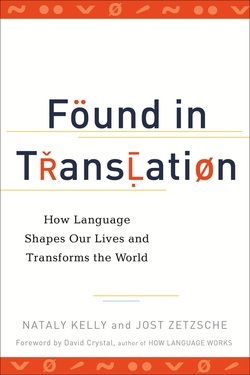 Translation fuels the global economy, prevents wars, and stops the outbreak of disease. From tummy tucks to terrorist threats, it's everywhere. This book will help you see how the products you use, the freedoms you enjoy, and the pleasures in which you partake are made possible by translation.
. . . which is to say, at the last minute I couldn’t schedule the job. In the meantime, the rights were bought by Springer in New York and the manuscript has been published in a fine translation by Elizabeth J. Hamilton and Deirdre Winter. I am posting the book here anyway because certain elements struck a chord with me. In particular, I was fascinated by the author’s mention of mirror neurons in connection with empathy. The idea of combining psychology and brain science intrigues me; I’m certainly not alone in that respect. It was Oliver Sachs (in a TED Talk) who made me aware of Charles Bonnet (1720–1793) and his famous question about how the theater of the mind could be created by the machinery of the brain. To learn more about the book and view a PDF of the text, visit Springer Publishing. Frank Staemmler is a gestalt therapist and a prolific author who maintains an interesting webpage. Here's a link to the English version of his site. This is no doubt somewhat unfair to visitors who don’t read German, but I am posting excerpts from a book which has not been published in English. In 2010, I translated some 50 pages from various sections of Antje Vollmer’s A Double Life for Eichborn Verlag. It is fascinating material, and I've always hoped a US publisher would discover it. 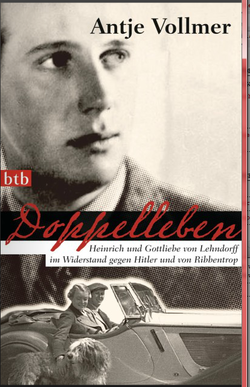 A Double Life recounts the story of Heinrich and Gottliebe von Lehndorff and their resistance against Hitler and Ribbentrop. But the book represents much more than homage to an overlooked member of the conspiracy against Hitler. Antje Vollmer describes the history of the ancient Lehndorff family, the role they played for centuries as leading citizens of East Prussia, and the privileged world they inhabited. By presenting the palpable, human side of von Lehndorff and his wife, and describing the incredible cat-and-mouse game they played with the highest officials of the Third Reich, the author brings the entire period to life. Below: the "all-points bulletin" for the arrest of Count Heinrich von Lehndorff. Lehndorff was sentenced to death on September 3, 1944, and executed the next day at Plötzensee Prison in Berlin.